Dogs are naturally inclined to support their companion. They care about you, even if they can’t say it. They always have time for you, though it has to be said that they may not want to take a bath when you want them to. But, for the most part, having a pet dog is possibly one of the best things that ever happened to its owner. What is it about a dog that impacts our lives so splendidly? Sure, we love having a friend around that wants to do whatever we’re doing, but there are a few particular aspects that affect our lives in a healthy way. Who can resist patting a happy friendly dog? Dogs are an instant icebreaker. What kind of dog is that? What’s her name? We all have questions that spring to mind when we meet a dog owner walking their loveable dog. Any dog owner can testify to the fact that once you have a dog, it’s an instant conversation starter. Some of the best places to meet other dog owners are at the park, through training classes, and even through online forums and discussions, posting a picture and your own story is a great way to start some conversation and talk about how great your pup is. Not only is this good for you, but it is also great for your dog. Socializing and familiarizing with other people and pets helps your puppy to develop a friendly attitude that will likely turn them into an irresistibly loveable dog that wants to get out there and attract some attention for the both of you. While dogs are a great way to socialize, they also have a positive effect on the body. Owners tend to maintain their health better than the average person. When we have a dog, we tend to go out for walks and enjoy a more active lifestyle. When we have a dog, we are naturally more inclined to live a healthy lifestyle. Additionally, studies have shown that young children exposed to pets tend to less likely develop allergies later in life. It seems a little strange, especially since most would regard dog fur and dander as instant allergy instigators. But during childhood, the introduction of pets can reduce the likelihood of developing allergies by one third and strengthen immune systems. While the body is important, it’s often that the inside matters even more. At times, we can feel a little depressed, perhaps because you caught the flu. Dogs instinctively seem to know that something isn’t right, and their special talents are needed. Dogs are perfect for our heart and soul. They’re always there when we need them, and are loyal no matter what. When we’re feeling down, we can always depend on our dogs. They are always there to offer a few licks and hugs to make us feel better. September 18th was Puppy Mill Awareness Day. This yearly event aims to educate the general public about the problems associated with puppy mills, as well as the actions that can be taken to address these issues. A puppy mill or a puppy farm is a facility that breeds puppies in large quantities. Some of the most common problems that can be found in puppy mills include overbreeding, inbreeding, overcrowding, unclean facilities, and lack of human interaction. And because the puppies are not fed well and do not always receive proper veterinary care, diseases are also prevalent, and many unwanted animals are killed. Puppy mills are illegal but have been around for decades. People are strongly discouraged from buying dogs from such places as the animals suffer from horrible living conditions. 1. Do not purchase from flea markets, pet shops, or online. 2. 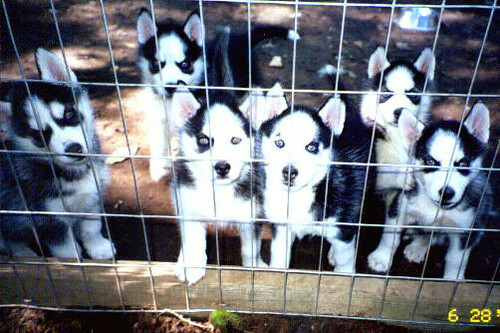 Look at how the pups are being kept. Do they live in small cages? Can they move around? Are their surroundings clean? 3. Observe the dogs’ attitude when they meet strangers. Are they happy to interact with people or are they hesitant? 4. See if you can meet the parents of your potential pet to find out if the dog breeder takes proper care of his animals. Check if they are healthy and friendly. 5. Different breeds of dogs have different needs. If a breeder offers various breeds, ask questions to see how much he knows about them. 6. Ask for client references. A reputable breeder should have no problem providing these. 7. Ask for the puppy’s vaccination and health history. 8. Most dog breeders provide after sales support. A responsible breeder will be available to answer any questions you might have after you’ve taken your puppy home. 9. Be wary of pushy dog breeders. Professional breeders give their clients time to think things over before making a decision. 10. Trust your gut. If you have a bad feeling about a certain breeder, you’re most likely right. 11. Another option is to adopt from shelters or rescue groups. Since these organizations are non-profit, you can rest assured that their top priority is the dog’s well-being. Always keep in mind that puppy mill breeders are only interested in earning money and do not care about the welfare of the animals. Help put an end to this cruel trade by not buying from puppy mills and telling other people about it. Teach your young children the do’s and don’ts of interacting with their pet and they’ll have life-long skills that will help them be confident and loving pet owners. By no means, should children approach any stray animal. Request permission first from the owner of the pet they wish to play with. Let an unfamiliar dog smell their hand first before they start petting the animal. Warn them not to play around with a dog that is eating. Children should not take any toy, bone or other essential foods from a dog. Teach them never to tease an animal. Kids should not run or yell when a dog is approaching them. Remind them to always be gentle whenever they play and talk with their pets. Children should learn that pets are their pals. You have to explain to your kids that giving their animals the same treatment they want to have is a good start. Animals too have feelings and can get hurt just like how humans can be hurt. Teach them not to pull the ears of their dogs or jump on their backs. Have fun and be safe! Any other tips? What did I miss?